Thum! Kaun Aata Hai? : Navy Wants Autonomous Underwater Vehicle (AUV) for Mine and Harbor Defense: L&T Adamya AUV a Frontrunner? Navy Wants Autonomous Underwater Vehicle (AUV) for Mine and Harbor Defense: L&T Adamya AUV a Frontrunner? MOD has initiated procurement of 15 lightweight (man-portable) and 10 heavyweight Autonomous Underwater Vehicles (AUVs) from Indian Vendors for Mine Reconnaissance and sea bottom mapping. A RFI circulated by the MOD states that the robotic device should have an on-board propulsion system, possess three dimensional maneuverability,y and be controlled and piloted by an on-board computer. The AUV would have a communication link with control platform on ship/shore but the Navy would also prefer an Automatic Target Recognition capability. AUVs are being developed worldwide to assist in mine detection and sea bottom mapping of harbors and other areas of interest. Other AUV applications include Intelligence-Surveillance-Reconnaissance (ISR), Clandestine Monitoring, Environmental Monitoring, even Anti-Submarine Warfare. Based on endurance and ease of handling requirements, the Navy has a requirement for both light weight (man-portable) and heavy weight AUVs for the Indian Navy. The Navy prefers a low maintenance vehicle with an automatic computerized system for carrying out integrated checks in assembled condition. The results from the checks should be recorded and displayed for analysis. 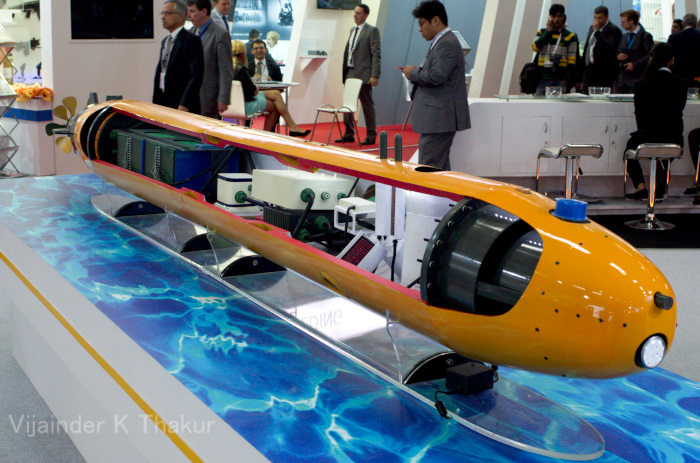 During DefExpo 2014 in New Delhi, L&T displayed its Adamya AUV. Adamya (the Sanskrit adjective translates to - impossible to subdue or defeat) has been developed in-house by L&T. It's unique in its ability to be launched from the torpedo tube of a submarine. The vehicle has a modular design and can be configured with different depth rated shells eliminating the need to pressure-proof the internal electronic system. It's subsystems can be accessed externally for rapid diagnostics and turnaround servicing. The vehicle, batteries and internals can be taken apart and packaged into air-ship-able sections, allowing the vehicle to be swiftly deployed in remote areas. The Adamya navigates with real time position accuracy. It has a velocity logger, an inertial navigation system with GPS update. It looks ahead using a Forward Looking Sonar (FLS) and a Under Water camera. The 850-kg AUV with a diameter of 533-mm and length of 5700-mm is powered by Lithium-polymer batteries with enough charge to keep it going for 8-hr at 4 kts. Two contra-rotating propellers give the Adamya a top speed of 6-kt, and a cruise speed of 4-kts. The vehicle is also capable of hovering. The vehicle communicates with its control platform using RF, acoustic or Ethernet via attached cable.